Are We Still In A Drought? 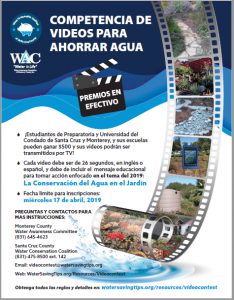 The 5th Annual Save Water Video Contest is here. Inspire others to save water or prevent water pollution by making a short newscast, skit, animation, commercial or even a music video. The winning films will earn $500 and be broadcast on TV and online! Inspire residents and/or businesses to take one or two specific actions that conserve water or prevents pollution in our gardens. See the Monterey Bay Friendly Landscaping Program for ideas. Tell a story about a resident or business that has taken action in their landscape to conserve our water resources or prevent water pollution. See these transformed landscapes for ideas of sites to feature. Create a visual representation of how much water is saved by being water wise in the garden. Create an infographic, an animated video or use special effects to convey data about the water saved using Water Wise Gardening techniques. This slide show about the video contest gives you tons of inspirational information for your video. 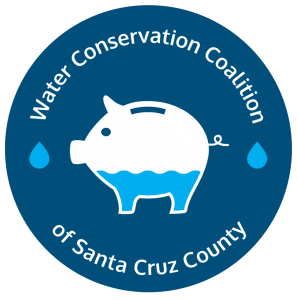 It focuses on water saving strategies in the garden that our local water agencies have prioritized as the most effective actions locals can take. Need some inspiration? Check out the winning videos from previous contests. Find the full media specifications and contest rules here. The contest is open to high school and college students throughout Santa Cruz and Monterey Counties. You may enter as an individual or a team. Upload your video to YouTube (at high definition). Submit one online entry form per team or video. The winning videos will be announced and may be shown at awards ceremonies in April or May at your sponsoring agency. Winning videos will also be broadcast throughout the summer on local TV stations. Top prizes get $500 to split evenly between the production crew. Judges will be looking for incorporation of the theme (Water Wise Gardening), impact, creativity, informational accuracy, and entertainment value. Tell your friends, or share our Video Contest Flyer with your teacher or classmates. stay informed on the drought! awareness and sharing with your friends and family! Not now. I'll do it later. de cómo ahorrar agua a sus amigos y familiares!